Writing about jewelry and royalty has helped me come into contact with some wonderful, talented writers. One of these pals, Lyndsy Spence, is a historian from Northern Ireland who writes about the fascinating women of the early twentieth century, especially the Mitford sisters. She and I were chatting recently about one of her current projects, and she told me a tiara story about an Irish viscountess that I knew you'd all love. Lyndsy was kind enough to do an interview about the story for the blog, even providing us with some great images from her archival research. Enjoy! You've told me some fascinating stories about Lady Massereene. How did you get interested in writing about her life? I have lived beside Antrim Castle, or at least the grounds it sat on (it was burned down in 1922), all of my life and so my curiosity with Jean, 12th Viscountess Massereene feels very connected to my setting, as I go to the grounds every other day. I'd known about the Massereenes, obviously, as every other building is named after them, but a few years ago a local newspaper asked me to write about Diana Skeffington, Lady M's daughter who died aged 21 in 1930, and as she is buried in the grounds I felt compelled to do some original research. I had no idea the person, whose grave I'd passed so often, died so young (a lot of the lettering is missing) and that one simple request would lead me to researching Lady M's entire life and becoming something of a Jean Massereene historian! She was an exceptional woman during an age when women were supposed to be good wives and mothers, and a decorative object for their husbands. She came from a political background and her father made his money in trade, and so she was used to a privileged lifestyle before she married into the aristocracy. She was clever and opinionated, and this was complimented by her famous beauty. I love that she was heavily involved in not only local life in Antrim but in Irish politics during the tempestuous Home Rule years. Another aspect of her personality was her love of the arts, and her fashion sense is incredible – at one point she owned a dress shop with society designer Elspeth Fox-Pitt. She was also a renowned occultist and very influential on that front. Her foes dismissed her as looking 'actressy' and 'impossible', but Lady M did not care. In fact, she had a cameo in the silent film The Great Love, and while visiting a WWI canteen a soldier asked if she had had much luck in Piccadilly the night before. She wore such flamboyant (or 'inappropriate', as her contemporaries were apt to say) clothing that she laughed it off and was not offended at all. It seems her entire circle was formed of misfits, and, until her daughter died, she threw herself into everything society (charities, balls, fashion shows etc) had to offer. She was happy to attend smart functions with the likes of Edith Londonderry and to raise money for her pet charities, such as the Women's National Heath Association, as she was to party with the Bright Young Things – her daughter's generation. I love her chameleon-like tendencies! We talk a lot about the jewels of aristocrats from the 19th and 20th centuries at The Court Jeweller. Who were some of Lady M's contemporaries? During the first decade of her marriage and owing that she became an Irish peeress aged just 21, she associated with older ladies such as Theresa Londonderry and the Duchess of Abercorn. But as her social circle grew she made friends from all over, and from all walks of life. 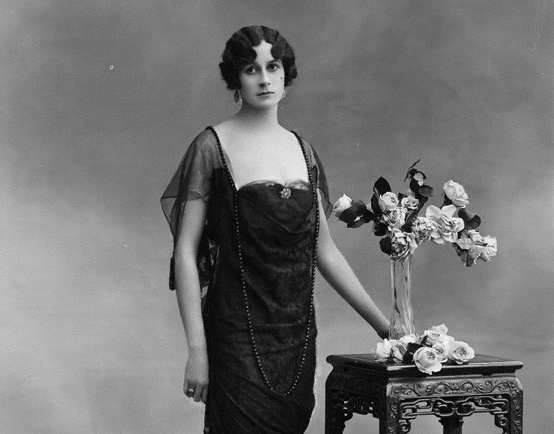 A great companion on the London social scene was Princess Maud, and she was friendly with Grace Curzon and the Duchess of Devonshire. 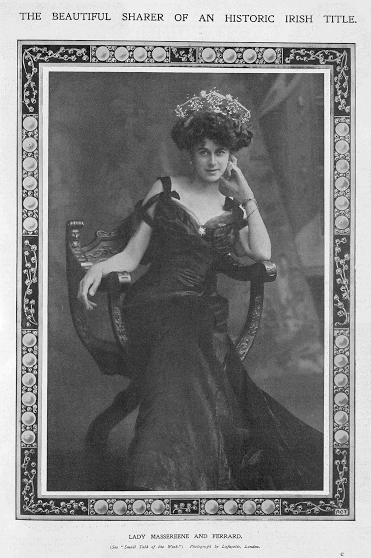 She visited Lady Katharine nee Carnegie (Viscountess Tredegar) a lot, who was known for her eccentricity and for sitting in a life sized bird's nest. 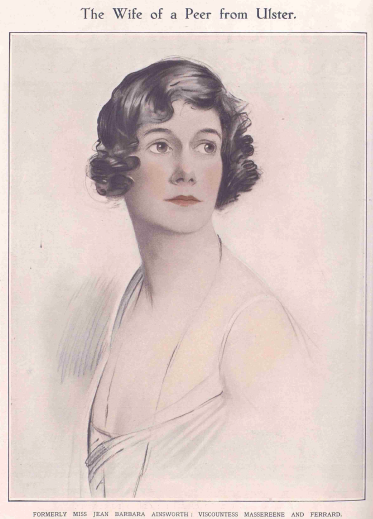 Her guest lists read likes a Who's Who, and she was at home entertaining Douglas Fairbanks as she was giving parties for Nancy Astor, Lady Evelyn Guinness (Diana Mitford's mother-in-law), the King of Greece, Dame Nellie Melba (with whom she stayed during an Australian holiday), and she contributed to the great society spiritualist Violet Tweedale's book, Ghosts I Have Seen. 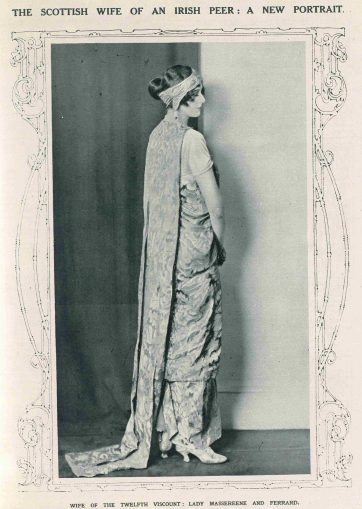 Interestingly, she often gave dances for the Duke and Duchess of York (future King George VI and Queen Elizabeth), but the Duchess thought her too socially ambitious -- perhaps this was misconstrued due to her personable nature -- however Lady M's dress shop provided her wardrobe for a royal tour of Australia in 1927. Okay, the entire reason I wanted us to do this interview was the zany story you told me about the theft of Lady M's tiara. Can you give us the details? In 1912 there seemed to be a great network of jewel thieves who were operating in London, and with connections elsewhere. Lady Massereene wished for her tiara to be sent to London ahead of her arrival for a function at Covent Garden, perhaps she wanted it to be cleaned, and when she went to get the tiara in question it was missing. She alerted the local police, and after their initial investigations she told them that, on three separate occasions, she had a dream that the tiara was lying on the bed of the Six Mile Water (a river running through the grounds of the castle), and such was her influence the police ordered Lough Neagh fishermen to comb the river bed. This amounted to nothing, and naturally Lady M was desperate to find her tiara. It was eventually discovered in London, having been stolen by this infamous network of thieves. As for the tiara itself, there is no mention of its significance or if it belonged to the Massereene family, except its appearance was described as seven inches in diametre and set with white diamonds of various sizes, and rising in a peak at the front four inches high. Do we know where Lady M's tiara is now? Lady Massereene had many tiara, including one with diamond shaped leaves, so it is hard to say. If she did get it back chances are it was sold some time in the 1920s when the Massereenes were experiencing financial problems. Or, if it was the family tiara, it could be in the possession of the current Viscountess, who is married to Lady M's grandson. But like Lady M herself, it remains a mystery! If you'd like to read more of Lyndsy's excellent work, I'd recommend checking out her biographies of Diana Mitford (Mrs Guinness: The Rise and Fall of Diana Mitford, the Thirties Socialite) and Doris Delevingne (The Mistress of Mayfair: Men, Money and the Marriage of Doris Delevingne)!